Ah, that wonderful smell of food wafting out of the kitchen throughout the house. Freshly-baked bread simply begging to be spread with butter and devoured while still warm; the melting butter and delicious dough delights your taste buds and brings back precious childhood memories of food being prepared by your mum. That’s the way they write about it in books and magazine articles. In reality, most of us don’t have the time or energy to make our own bread – and our mothers probably didn’t make their own loaves, either. Unless there was a bread maker in the house. Bread makers have grown in popularity over the years, and for good reason. They’re relatively easy to use and they turn out perfect loaves – if they’re a high-quality machine used properly. Otherwise, the final product can turn out to be mealy, heavy or overly crusty, guaranteeing that the machine, along with the promise of wonderful smells and even better breads, will be tucked away in a cupboard never to be seen again. It doesn’t have to cost a fortune to do things right. Many of the best bread makers are available in the £100 range, with some selling for quite a bit lower. The key to choosing the right one to buy for your kitchen is determining exactly how (and how often) you’ll be using it and what types of loaves you’d like to make. 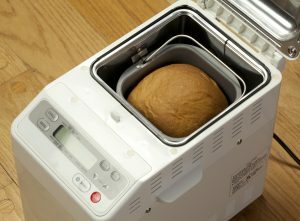 Of course, features and price will also factor into your choice, so we’ve compiled a full list of the top ten bread maker reviews and a detailed buying guide, to help with the process. Let’s check out the buyer’s guide first. Before doing anything else, let’s set some parameters. 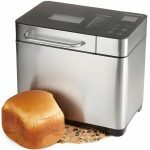 You can spend £200 or even more when you buy a home bread machine but we don’t think that’s necessary for most; for half that price you can find a terrific appliance that will turn out just about any type of loaf you could ever want. Some of the entrants on our top ten list may come in a little over the £100 mark, but most will be substantially less expensive. The other important parameter to consider before you buy a specific model is how large an appliance is – not just for the amount of counter space it will require, but also for the size it can produce. A smaller model that makes a 300g loaf may not be sufficient for a large family, while one that can whip up a larger size might be overkill for a couple without children. Also be aware that smaller ones usually turn out square loaves because of the size of the pan inside, but large models more often produce rectangular breads. Nearly all machines like this will be able to produce white, brown and wholemeal loaves, but many are better at working with some grains than others. If you prefer a specific type, choose one which outperforms the field in that area. There are those that allow you to make granary, rye or other special varieties, so if your interest lies in that area you should look for a model with the appropriate programmes. Varieties with ingredients which must be added during the cooking process, such as raisins or seeds, are best handled by a model which has an automatic dispenser or allows you to set custom programmes. Similarly, many models have “gluten-free” settings which might be crucial features for those with health issues related to food being consumed, while others include settings for making normal dough or pasta for cooking, a “bake only” setting for preparing batter for a pre-mixed cake, or even a setting for making jams. Each of these options may add to the price, but may be just what you’re looking for. A fast-bake setting can come in handy for many families on-the-go, but look a little more deeply; some manufacturers’ idea of “fast bake” isn’t very fast at all, some only allow this for white bread, and many don’t do a proper job when the baking process is accelerated. One telltale sign of loaves which have been made in a home machine is the hole that the kneading paddle leaves on the bottom of the loaf after it’s done. One way to ensure that the hole is as small as possible is to choose one with a removable paddle which can be taken out partway through the cooking process, or a model with a collapsible paddle designed to not leave holes at all. The control panel should be simple to read and use, with the most important options like size and crust settings (colour, thickness and crispiness), and the timer, easily accessible. Many buyers love a “keep warm” button right on the panel as well. A see-through window can help you judge the “doneness” and also impress guests attracted by the smell of something baking in the oven. Needless to say, the quality of the finished product is more important than almost any of the criteria we’ve listed, so we’ve been sure in each of our reviews to focus on the texture and taste of the bread produced – not just the features. We don’t know about you, but we’re already getting hungry. Let’s get started. UK customers will be delighted that the SD-2511 also makes terrific scones, with a rustic scone setting allowing you to produce delicious sweet or savoury treats (this model has a mind-boggling total of 33 settings including rustic artisan, sourdough, plain, and jam). Two removable paddles come with the SD-2511, one of them specifically for rye and spelt, there’s an automatic nut and fruit dispenser for putting your favourites into the mix at the proper time, and you can also blend in ingredients like cheese, sundried tomatoes and olives. 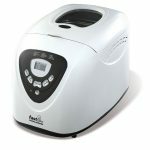 This model lets you easily choose between small, medium and large (they’re 400g, 500g and 600g, however, which might not be large enough for your family), you can select a browning level for your desired crust colour, and the unit even has inside and outside temperature sensors to ensure that a cold counter doesn’t ruin your bread. The end result? A loaf that’s perfectly-baked, consistent and delicious. This is one of the more expensive models on our list – but it’s the best. If you’ve read the title of this review, you already know one of the qualities that differentiate the SD-ZB2502BXC from the previous model: it’s made from beautiful stainless steel. It also takes up a slightly larger footprint on the counter, it has a “power interrupt” feature that lets the allows the maker to pick back up where it was after a brief outage, and it has a separate yeast dispenser to keep the yeast completely apart from the water, making for exceptional quality bread. The other features are basically the same as on the SD-2511, except for the fact that there’s no sourdough setting – which is why we’ve ranked this model at #2 instead of #1. As you’d expect from Morphy Richards, this is a very good appliance at a very good price. You can choose between three sizes (1, 1½ or 2 pounds, so between 450 and 900g); light, medium or dark crust; and basic, wholemeal, French, cake and jam modes. The 48280’s fast-bake mode really is fast, baking a large loaf in under an hour. Unfortunately, the quality is not as good as that of one that runs a full programme. This is a compact unit which will fit easily on your counter, and it’s a bargain. This one is several notches below our top choice (the SD2511) because it doesn’t have an automatic fruit and nut dispenser and only has 12 operating modes (although it does include options like rye, French, granary and jam). It also has a gluten-free mode. It’s not in the name of the product, but the 2501 also has a gluten-free setting. In fact, it’s just about identical to the 2500, with the only difference the inclusion of an automatic nut and fruit dispenser (which adds quite a bit to the final price). Otherwise, you already know all about this brand’s standard three sizes, crust settings, operating modes and tasty finished product. Go for this model if you want the automatic dispenser, but choose the 2500 if you’d rather save money. There’s a lot to like in this stainless steel, reasonably-priced model. There are three selectable sizes (500g, 700g and 1000g), it has 17 presets including sourdough, gluten-free and yoghurt, there’s an auto-dispenser and a 15-hour delay timer, and a small see-through window on top (with an internal light). Bread that comes out of the Andrew James is a little denser and not quite as satisfying as those made in one of the previous models we’ve reviewed, but it’s still much tastier than that bought from the store; on the downside, this one is rather noisy and the instructions are somewhat hard to follow. The pros, including the price, definitely outweigh the cons thus making it a good buy. Among the priciest of the machines we’ve reviewed, the BM450 is a large, sleek stainless-and-glass unit that lets you see through the top to watch your loaf cook. The 58-minute quick-bake function turns out better loaves, although the overall taste and consistency of the Kenwood’s output was slightly lesser than many competitors, and the hole at the bottom of the bread was slightly larger. There are 16 programmes including the standards plus gluten-free, jam and dough, as well as five user-programmable settings that allow you to adjust the pre-heating, kneading, rising and baking cycles – the latter being the strongest arguments in favor of the BM450. 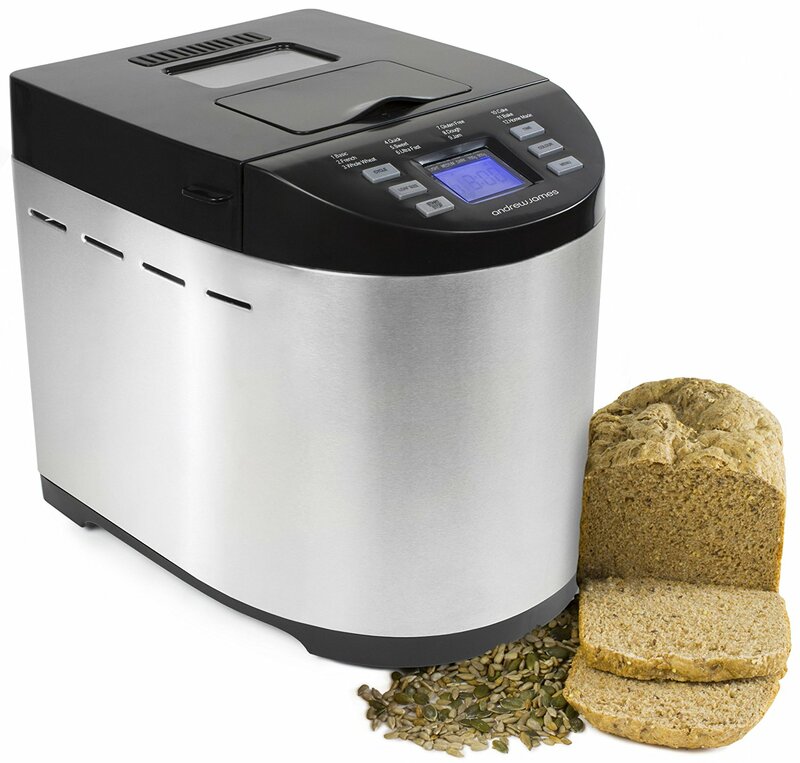 This is a lower-priced and compact thus making it suitable for those who simply want to make bread. There are only 12 settings, but they will let you make three sizes of acceptable white, wholemeal, French plus jams and cake batter that’s tastier than store-bought, but often has an uneven texture. There are two fast-bake settings, a large viewing window, a 13-hour timer and power cutoff protection; however, there’s no ingredient dispenser, it’s rather noisy and getting the pan to sit properly can be a bit of a pain. We like the Russell Hobbs primarily as a “starter model” for beginner bakers. Nothing’s better than waking up the smell of freshly baked bread and this is what the Morphy Richards 48281 can do for you every morning! It has a 13-hour delay setting which you can set just before you go to bed after you’ve loaded up all of your ingredients. Not a fan of waiting? No problem! 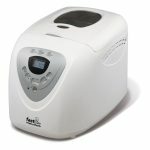 This model also has a fast bake setting so you can have a freshly baked 1 lb or 2 lbs loaf in under 50 minutes! This breadmaker can not only make loaves of bread for you, but it can also bake cakes, make jams, and even marmalade. For those who would like to go gluten-free, the Morphy Richards 48281 comes with 100% gluten-free recipes in the instruction manual. 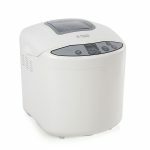 Last on the list is the Andrew James Digital breadmaker. Let’s face it, even if you’re a baker by profession, there will be days when you just want to enjoy a delicious freshly baked load without having to do all the work. Well, this breadmaker can deliver just that. This machine is great for those who don’t really have enough real estate on their kitchen counter. It is compact – measuring only 35cm x 26cm and 31cm high – so all it needs is just a small corner in your kitchen. It has 12 preset cycles which can definitely deliver whatever type of bread you may fancy for the day. It also has a 13-hour delay timer, a 60 minute keep warm setting, and an automatic dispenser that’s perfect for nuts and other toppings you would like on your bread. All this talk about freshly-baked bread has us ready to head into the kitchen, and we’re guessing you’re getting pretty hungry as well. We’ve hopefully done our part, running down the best bread makers on the market and giving you all the tips you need to choose the right model – the rest is up to you. Just remember that you’ll need to determine the size you want to bake (as well as the size of the machine that will fit into your available space) and the varieties you want to make, before deciding which will be the right one for your needs. We’re obviously quite partial to the delicious loaves produced by some models, but a small bread may not be adequate for the size of your family. In that case, any of the other machines in our rankings are worth your consideration. After all, how much longer can you put up with store-bought bread when you can easily make vastly-superior loaves at home?